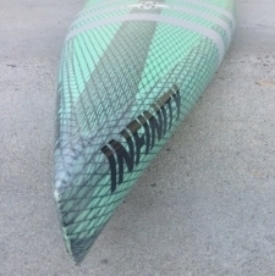 All Infinity paddle boards are shaped and designed by Steve and Dave Boehne using the finest materials available in the USA. Custom boards are professionally designed on premiere CAD software to ensure the greatest consistency, then meticulously finished to the highest standards by hand under one roof start to finish, right here in Dana Point CA.We shape all boards with high quality 1lb. EPS foam then wrap the entire blank in Q-cell to seal the pores so there is minimum resin soaking into the foam. This creates a lighter board with the same strength to weight properties. TEAM VECTOR: This would be considered our entry level construction but it’s so much more. Our entry construction is most companies premium construction offering. Light and durable. TEAM 50/50: Recommended on boards for serious racers, riders who encounter chop frequently, weight conscious riders who want color. TEAM CARBON ELITE: Premium Elite level construction. The lightest, stiffest, strength to weight ration available today. Used for Elite level racing. Riders wanting the lightest possible construction like the Pros. Every Infinity Surf SUP is built with performance in mind. Blending strength to weight construction with world class design. Infinity has been making surfboards since 1970 and SUP surfing shapes since 2004. The “ST” is an all around racer developed by Dave Boehne with input from Slater Trout. This board features a very straight outline from tip to tail that increases stability and an all new rocker that likes to plane on top of the water rather than slice and part it away. This board is super forgiving in chop and is a beast paddling upwind/upchop. Slater claims it to be the “fastest board in the bumps I’ve ever ridden” and if you have the motor this board has been proven to sprint faster than any board we make. Slater took 1st Place 2014 Payette River Games flatwater sprint and 8th place 2014 Battle of the Paddle. Versatile indeed. The Whiplash is Slater Trout’s signature all arounder that has been proved the world over in all conditions. If you seek a board that does it ALL pretty darn good, this is your board. Noun 1. Whiplash: an injury to the neck (the cervical vertebrae) resulting from rapic acceleration on an Infinity SUP. Slater’s number one request with this board is “make it easy to paddle” Rather than focusing on a single design goal, Slater wanted a board that is versatile and does everything well. Flatwater, open ocean, down wind, up wind, chop, riding bumps etc. No matter the venue or conditions he could pull this board out of the bag and be ready on race day. All new updated design for 2015. The whiplash features a very boxy flat bottom increasing the stability for riders pushing to go narrower. Has more flip in the nose and tail from the Dart board offering up more forgiveness across different conditions. We also turn down the nose for aiding in side wind and a low profile stealth look. You can’t go wrong with the Whiplash as Slater has made the podium all over the world in all types of racing conditions against the worlds best on this very design. We are able to make the whiplash with Flat deck, shallow recessed cockpit and our signature deep recessed cockpit with scupper drain. The Cutthroat is Slater Trout’s signature Ocean Racer. Completely new and redesigned for 2015 we worked directly with Slater and the Infinity SpeedFreaks to make the most versatile ocean and intra-coastal racer available. This board bridges the gap for people who paddle both flat and open ocean conditions daily. With an all new 3 stage rocker that increases forgiveness in chop and downwind sliding while maintaining competitive flat water glide. This board sprints incredibly fast and has also been a great choice for surf race style competition. The secret is the all new "3-Stage" rocker design. This board features a rise in the front rocker matched with a longer flatter speed section before exiting with an excellerated kick in the tail. The Cutthroat features our new custom “flat” deck cockpit for max comfort and that surfboard feel while moving about the board in bump and bottom concaves for added stability and lift. Flat water racer with "Destroyer" nose. The Dart bow can be even sharper with a more V’d bottom than the Canoe nose because the hull gets narrower from the deck down. This means that the deck is not as narrow or V’d as the Canoe nose, but below water line, it is sharper. Low profile needle style nose provides fast "out of the gate" speed while forcing the wide point in the outline further back. This helps with stability and also creates a closer to the body, more powerful stroke. The extreme wide tail adds stability and snags everything resembling a bump. Every race board is custom made so everthing from width, tail shape, cockpit depth, color etc is customizable upon consultation. You can choose either bow depending on your opinion of bow shapes. Both the Canoe nose or Destroyer nose can be made with a solid, ½” fiberglass tip that will make them stronger and even sharper. The Dart is the ultimate flat water weapon. The finest displacement racing down a parallel outline makes up for a very fast and incredibly quiet paddle. Because of the longer length, these boards can be shaped narrower while maintaining adequate stability. They often are from 23” to 27” wide. We normally do our deep cockpit with a drainpipe to maximize stability. Boards this length are difficult to steer against the wind or turn around race buoys, so most guys get them with foot steering and a rudder. They are available with a Canoe or Destroyer nose. Both the Canoe nose or Destroyer nose can be made with a solid, ½” fiberglass tip that will make them stronger and even sharper.